DON’T GET CAUGHT OUT IN THE NEXT STORM! Want some protection and battery back up for your Business Telephone System during any future unexpected power outages? Next time be prepared with an uninterruptible power supply (UPS) unit ranging from as little as $210+GST – you wont lose your phones during short power outs and it will buy you time to divert lines or set up a generator if the blackout is extended! The advantages of a UPS “is set and forget” and it actually helps protect the phone system from power spikes which also prolong the systems life. 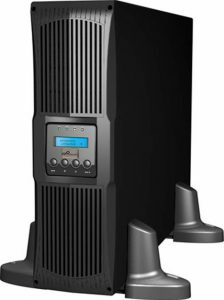 Normally blackouts are for a fairly short duration so the UPS makes life easy and for peace of mind. Technologies for all applications ranging from 600VA to 4mVA in Line Interactive for home office / small business, Pure Sinewave Line Interactive for small business / server applications and On Line (Double Conversion) – for corporate, commercial and industrial applications. Problems associated with power and the ability to solve issues with Uninterruptible Power Supplies (UPS)! The functioning of our highly sensitive electronic equipment is dependent upon the supply of clean, consistent power. In this Age of Technology, our ever growing demand for power often exceeds supply. Today computers are used to control the operation of many different types of facilities. Despite all the advances in technology, one thing that has not been improved sufficiently is the susceptibility of the computer to power problems. Computers are among the most sensitive types of electronic equipment. Although there are many problems which can cause data loss, the largest cause of data loss is related to power quality. The function of the computer system will vary it’s susceptibility to power quality issues. Brownout – also called a sag – is a “dip” in the voltage level from the electrical power supply. These are extremely common and occur without warning and often without the consumer knowing. Power Sags or Dips account for the majority of power quality problems. Spike – also called a surge – is a very rapid and temporary increase in the electrical power supply. These are a serious source of distortion and are a most destructive problem. Blackout – also called an outage or interruption – a total loss of supply for a period of time. Transients – a temporary excess of voltage, current or load in an electrical system which has been disturbed. Transients are short duration events. Harmonics – a recurring distortion of waveform of the supply voltage. Notching – a disturbance of opposite polarity. Overvoltage – occurs when the voltage is raised above design limits. Short Circuits – when two electrical wires (Positive and Negative) are incorrectly connected together. Swell – an increase in voltage. Frequency Variation – a change in frequency from the power source. Power Factor – measure of the effectiveness with which an electrical device converts volt-amperes to watts. Power quality problems which affect computer systems can cost businesses from a couple of hundred to many thousand and even millions of dollars depending on the severity of the problem and the nature of the business. With our power suppliers unable to guarantee the quality of supply, the consumer is forced to take responsibility for the health and safe operation of their equipment. Prevention is better than cure. Most of us understand that electrical surges can damage a computer system, but many do not understand that most power related problems are not so obvious. When accounting records display customer “A” as owing $100 when it should be $10,000, or when invoices from last month became corrupt or unreadable, it often put down to incorrect data entry or a computer “virus”. This is not always the case. In fact in 45.3% of cases the real cause of this data corruption is from power related problems. Problems that are related to power include errors in data files, excessive wear and tear on hardware, keyboard lockups and worst of all, hours of work and data lost. It has been recorded that a typical computer is subject to more than 120 power problems per month. With such a high proportion of data loss being caused by power problems it is necessary for all business to consider looking at power protection systems. Most people believe that blackouts are the biggest problem associated with power. However, recent figures indicate otherwise. Businesses should be concerned about power problems as even the smallest disruption can cause damage to computers, networks, and other sensitive electrical items including cash registers, telephone systems, eftpos machines, computer peripheral equipment and process control equipment. At the very least power problems can cause data loss and unexpected shutdowns. In severe cases, bad power can cause damage or destroy equipment. Bad power can be identified by many different indicators including a computer’s monitor and indicator lights flickering or becoming wavy; unexplained errors in transmission of data; sudden loss of Internet connections; system lockups; aborted modem transfers; and hard drive crashes. Causes: Start-up power demands of electrical devices e.g. motors, elevators; inadequate power supply; poor circuit design. Some utility power companies cope with extreme demands on the power grid by systematically lowering voltage levels in certain areas for hours or days at a time. This procedure is known as a rolling brownout. Effects: Computers become starved of the power required to operate, resulting in frozen keyboards, unexpected system crashes, reduced efficiency, reliability and life span in electrical equipment, active data loss and/or data corruption. Brownouts are often followed by spikes which are also damaging to computer components and data. Effects: Computer lock up and data loss. Spikes are like an electrical tidal wave to any electronic equipment. Reality: All computers should be protected from power fluctuations and outages. Our demands for clean, consistent power continue to rise and our utilities are already struggling to meet demand. This is unlikely to change as it takes approximately ten years to bring a new power plant on-line. Concerns as to the most efficient method to produce power (coal, gas, wind, solar, co-generation etc) have also slowed construction of many new power projects. With our power suppliers unable to guarantee the quality of supply it is up to us to put measures in place to protect the health and safe operation of our vulnerable equipment. Most of us are familiar with the benefits of installing surge arrest boards, but these are only capable of providing part of the solution. We suggest you consider the advantages of installing a UPS.